As always, if you click on the image you can see the full resolution and complete image. My first reaction was, “Whoa! That tiny pit is at the head of an increasingly growing canyon!” To a caver on Earth, this instantly implies that water has flowed out of that pit and down the canyon, carving it out as it flowed. It also implied that the possible underground passage under the pit’s north rim might conceivably be extensive. Reinforcing this first impression were the numerous dark streaks flowing down the canyon’s cliff walls to the south. They all seemed to originate at about the same elevation as the pit itself, suggesting they all come from the same contact between two geological layers, a contact where water tends to gather. On Earth, when water seeps downward through water-soluble limestone and then gets blocked at a contact of more resistant material, it then starts to flow horizontally, creating a cave at that contact. 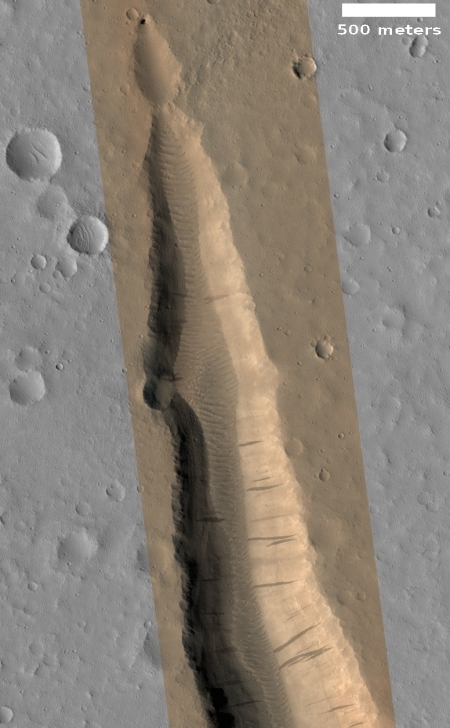 The Martian dark streaks and pit in the image to the right suggest a similar process is occurring here. I was now very intrigued, and decided I needed to see if MRO’s high resolution camera had taken any more images in this area. I also wanted to know where that canyon went to the south, and how far it went. At the MRO image archive I did a search by location, zooming in on the pit’s latitude (North 28.787°) and longitude (East 284.591°). 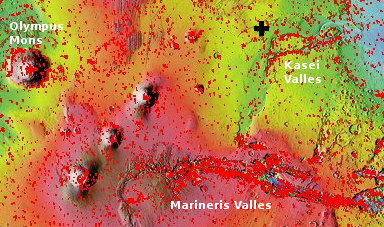 The image to the left shows this image’s general location, indicated by the black cross at the northwest edge of Kasei Valles, one of the many gigantic canyon systems draining downward from Mars’s biggest volcanoes. Though far smaller than the more famous Marineris Valles to the south, Kasei Valles is still incredibly long and large, about 1500 miles long and 300 miles wide in places. In comparison the Grand Canyon is only 18 miles wide at its widest, with a length of less than 300 miles. This story gets better. 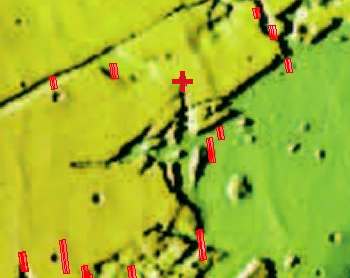 As I zoomed in I discovered that the high resolution MRO image of that pit above, only about 160 feet wide, was located at the end of one of the major canyons draining into Kasei Valles, as now indicated by the red cross in the image to the left. While the pit might be small, whatever drained from it was, over time, able to carve a truly substantial channel, as part of the one or more one or more catastrophic floods that formed both Kasei and Marineris Valles.. The image to the left also shows that MRO has taken no other images of this canyon or its surrounding terrain, so we do not really know whether there are more cliff seeps along the canyon walls to the south. The lack of images also leaves open the question whether there are any other entrances to the north of this pit, on the plains above. I leave you with one last image on the right, cropped from a Mars Odyssey image and showing the entire canyon south of this tiny pit. 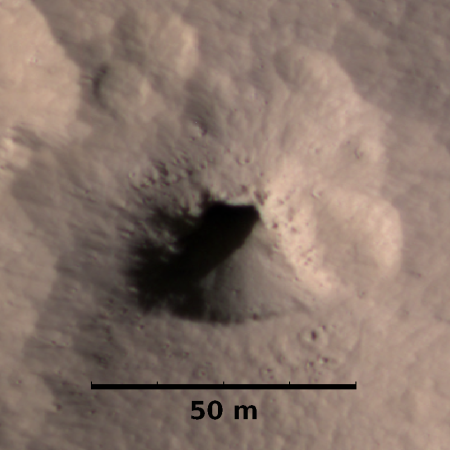 Though I don’t have a scale for this photograph, the white box shows the approximate size of the MRO image above, with the location of the pit indicated. By extrapolating the scale on that image, I estimate that the distance from the pit to the canyon outlet is about 40 miles, with the canyon outlet about ten miles wide. In other words, this tiny pit is one of the major sources of a canyon that is in many ways comparable to parts of the Grand Canyon. How spectacular is that? 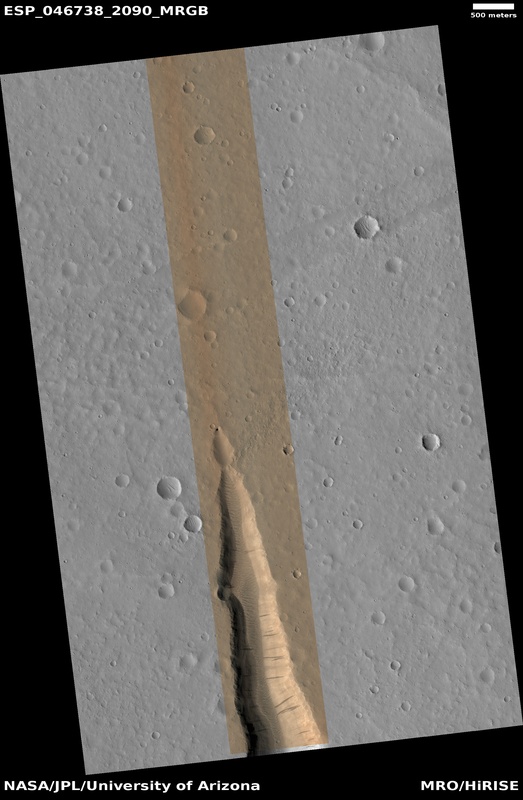 The Mars Odyssey image to the right makes its clear that this pit is not the only source for this canyon. Drainage from the side tributaries certainly contributed, as did the many seeps that I suspect line the walls of this canyon. Moreover, the canyon itself appears to have been formed along faults, so that water from that single tiny pit did not do all the work to form the canyon. The geological structure itself contributed. Nonetheless, the data illustrated by these images makes that tiny pit most enticing. It not only appears to be relatively easy to access its interior, there is visual evidence that suggests the presence of water. 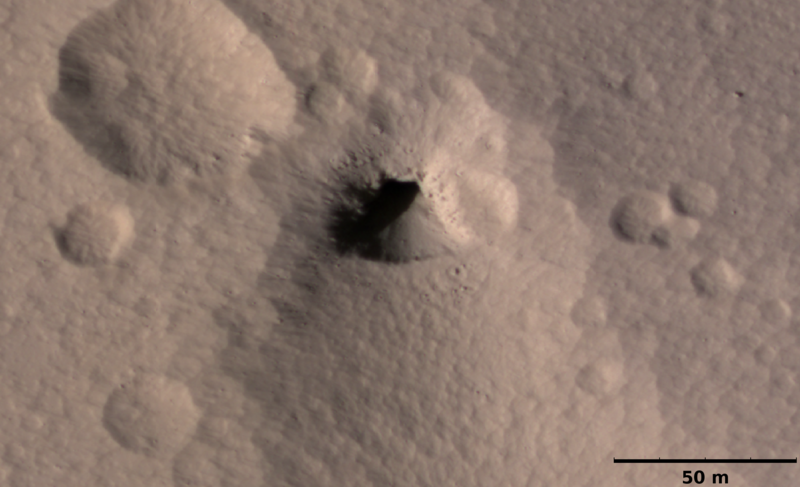 If I was a future settler of Mars, I would give this pit a very high priority for exploration. In fact, I think someone (maybe Elon Musk?) should already be considering a probe to delve its depths. Bob, There is a problem with the last photo, it’s not showing in the text. Could you repost the image? Thanks! Col Beausabre: I see the image, so I don’t know what the problem is. The post has five images total. Do you see five? (RED FACED), Bob, problem fixed. Undoubtably operator headspace. The amount of liquid implied by the canyon system suggests the original outlet to the surface eroded and migrated upstream for a long, long way during the active period — and that the flow diminished considerably toward the end of that period until the current pit was all that was left. The cross-canyons intersecting the way they do is odd; closer inspection of the interface between them and the pit’s canyon should be very interesting.